Congrats on turning the heel. I learned the hard way (little holes) to pick up a few extra stitches, then do the gusset decrease for a few more rows, or k2tog where it will look okay. I second the Opal Tiger yarn - I should have enough left over from the hat for fingerless gloves - there is a lot of yarn in a single skein. Hi! 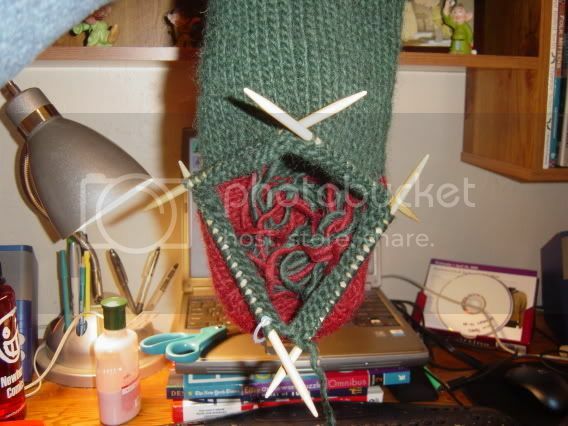 I came across your blog while 'random knit blogging' and see you are a fellow Rhode Islander. (Though not for long I see too!) I enjoy your site, and how you are steadily learning new knitting techniques.